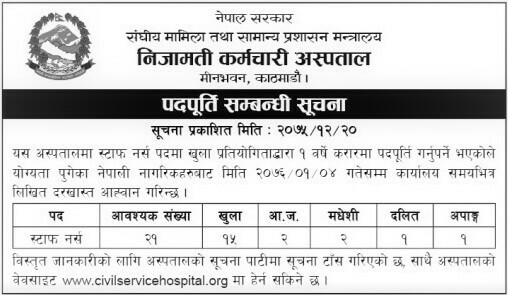 Government of Nepal, Ministry of Federal Affairs and General Administration, Civil Service Hospital of Nepal, Minbhawan, Kathmandu published announced vacancy for the position of Staffs Nurses. Qualified candidates may apply for the said vacancy before 2076-1-4. For detail information, candidates can check notice from the notice board of the hospital or visit the official website www.civilservicehospital.org. Application deadline: Baisakh 4, 2076.